As perhaps the biggest living legend of rock, Paul McCartney would raise few eyebrows if he stayed in a comfort zone of rehashing Beatles tunes to adoring nostalgists. Instead, the 76-year-old has recorded one of his most ambitious albums in years, "Egypt Station," displaying not only a predictable confidence in his classic sound but an eagerness to freshen it for a new era. "Egypt Station," which comes out on Friday, reveals an artist who feels on top of his game and has rooted out whatever negativity has built up over the decades. "I used to drink so much / Forgot to come home / I lied to my doctor / But these days I don't / 'Cause I'm happy with you / I got lots of good things to do," the thrice-married McCartney, his guitar aptly jaunty, sings near the start of the 16-track album. His sanguine tone extends beyond his own life. "Despite Repeated Warnings" is a seven-minute parable about the fledgling fight against climate change and naysayers such as Donald Trump -- taken on in the song by earnest passengers on a disaster-bound ship. "The engine's going to blow and we're going to be left down below," McCartney warns before repeated shouts of "Yes, we can do it!" The song shifts gears into four distinct parts with an intensifying guitar and horns fueling a sense of foreboding. Plenty of the music is Beatles-esque on "Egypt Station" such as "Do It Now," whose intertwining minor-key piano and harpsichord lines belie the message of alacrity. But the music veers in unexpected directions. McCartney bellows like a hard rocker on "Caesar Rock." Even more striking, McCartney embraces the hoots and hollers and electronic voice effects of millennial-generation pop-rock on "Fuh You." As if inspired by the genre, "Fuh You" features some of the album's most banal lyricism -- "Want a love that's so proud and real / You make me want to go out and steal." The song was produced by Ryan Tedder, the singer of OneRepublic, while most of the album was supervised by Greg Kurstin, the in-demand Los Angeles musician best known for co-writing Adele's mega-ballad "Hello." 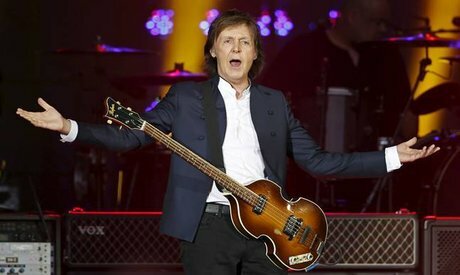 "Egypt Station" is the first album in five years by McCartney, who has shown renewed vigor with extensive touring since 2016 and dates scheduled through 2019. The album has no explicit connection to Egypt with the ancient country instead an exoticized metaphor for a distant, dreamlike journey. McCartney, more known for his fascination with India than Egypt, has explained that he sees the album as a travelogue, not merely of place but of sentiment. The album kicks off with a snippet of train noise before "I Don't Know," an unusually subdued opener which McCartney has described as his favorite song on the album, a mid-tempo piano ballad about self-doubt in a relationship. "Back in Brazil," one of the catchiest tracks on the album, pays subtle tribute to the South American musical powerhouse with its syncopated rhythm section but is marked more by a funky organ and a whirling clarinet solo. On "People Want Peace," McCartney renews the familiar pacifist optimism inherited from the Beatles but offers a 21st-century production, the Gospel vocals and strings reinforced by booming drums. "The message is simple / It's straight from my heart / And I know that you've heard it before," McCartney acknowledges on the song. But he explains: "I'm not quitting while people are crying for more."